The meninges are membranous layers of protective tissue that surround both the brain and the spinal cord. Their main function is to protect the brain, form a supporting framework for arteries, veins and venous sinuses, in addition to enclosing the subarachnoid space. The subarachnoid space is a cavity filled with cerebrospinal fluid that is vital for the normal function of the brain. The meninges of the brain and spinal cord are continuous and linked together via the foramen magnum. They are comprised of three layers: the dura mater, the arachnoid mater and the pia mater. The cranial dura mater is the tough dense outer covering of the brain. It is firmly adherent to the skull, and made up of an external periosteal layer, and an internal meningeal layer. The periosteal layer is continuous with the periosteum on the outer surface of the skull, and contains the meningeal arteries. The meningeal layer is continuous with the dura mater of the spinal cord, and lies in close relation with the arachnoid mater. These two layers separate from each other at certain locations to form the dural partitions (falx cerebri, tentorium cerebelli, falx cerebelli, and the diaphragma sellae), and the intracranial venous structures. The arachnoid mater is the delicate middle layer, situated above the subarachnoid space. It’s avascular, and lines the inner surface of the dura mater, though remains detached from it. Thin processes extend from the arachnoid mater to become continuous with the pia mater layer. The pia mater is a thin membrane that adheres to the brain, adopting its contours. It embeds the grooves and fissures of the brain, and is highly vascularized. 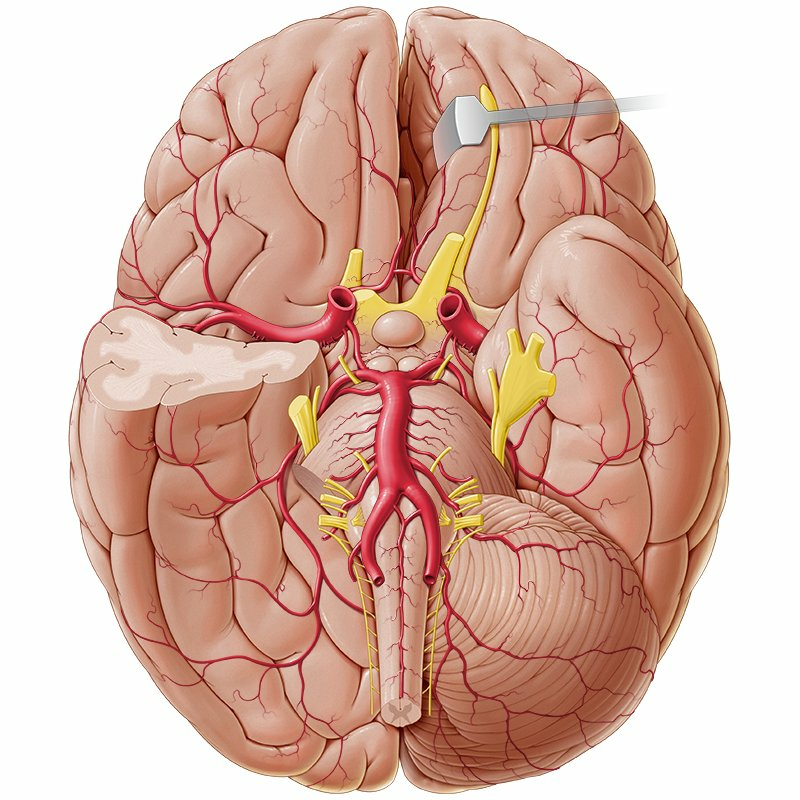 The vascular supply of the brain depends on two arteries, the vertebral and internal carotid arteries. They connect in the cranial cavity to form the cerebral arterial circle of Willis. The pair of vertebral arteries enter the cranial cavity via the foramen magnum, inferior to the pons. They fuse together to form the basilar artery. The pair of internal carotid arteries on the other hand, enter the cranial cavity via the carotid canals situated on each side of the skull. The vertebral artery originates from the first part of each subclavian artery, at the lower part of the neck. It gives off a meningeal artery, anterior and posterior spinal arteries, and a posterior inferior cerebellar artery, before uniting with its counterpart to form the basilar artery. The branching of the basilar artery includes the anterior inferior cerebellar arteries, small pontine arteries, and the superior cerebellar arteries. It terminates at a bifurcation that gives rise to the two posterior cerebral arteries. The internal carotid artery originates as one of the two terminal branches of each of the common carotid arteries. It branches into the ophthalmic, posterior communicating, middle cerebral, and anterior cerebral arteries. The venous drainage of the brain starts with a network of venous channels that lead to the larger cerebral and cerebellar veins, as well as the veins that drain the brainstem. All of these veins, along with the diploic and emissary veins, empty into the dural venous sinuses present between the two layers of the dura mater. The venous flow eventually drains into the internal jugular vein. Want to learn more about the Ventricles, meninges & blood vessels of the brain?